Earlier this year I recommended two games for iOS that I hadn’t actually played on iOS and I’m here now to un-recommend. But both of the games are amazing and you should play them, just on different systems. General review: In Aquaria you play as an creature who lives in underwater caves and has no memory. You set out to make discoveries and during the course of play you uncover the history of yourself as well as a set of long lost civilizations all wrapping up in the story of the creation and downfall of a god. The game is vast and takes a long time to play. You are in an open world, meaning you can venture into almost any area of the game at any time. There are a few features that block your way until you gain new abilities but those abilities also unlock some fast travel systems later on which is great because you will be revisiting areas. There is a map and a note system so you can mark areas to return to. The game can be at times delightful and spooky and just when you think you cannot possibly find anything new everything changes completely, and then it changes again. I adore the feeling of exploration in this game, there is an amazing amount of space to search and most every area has a secret to reveal to those who look closely. If you get stuck or want hints the forums at Bit Blot are very thorough. The character development, soundtrack and story all lead to most people, including myself, having an emotional attachment. It’s one of those games to dive into in the depth of winter or if you break a bone and are immobile for a while. Bonus points for the main character and most of the secondary characters being well developed and powerful females. Game includes impressively vast open world exploration, puzzle solving, combat, resource gathering and crafting and an amazing story and soundtrack. For game nerds I’ll point out that one of the developers went on to create a game called Spelunky, you might know it? Available for PC, Mac and Linux (DRM free). Also on Steam. 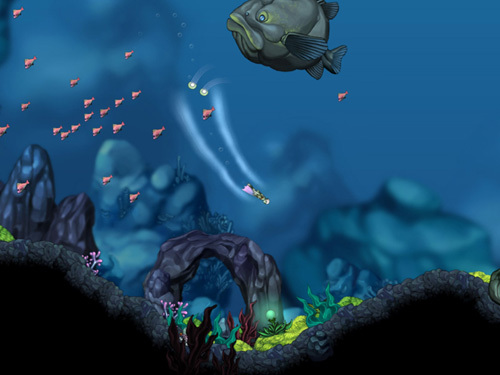 Aquaria was made by two developers, check out their other stuff: Alec Holowka’s projects can be found at Infinite Ammo and see Derek Yu‘s site. The Cave is a game by my beloved Double Fine that I hadn’t played yet but was on my radar. I bought it for my iPad and got stuck almost right away because the tablet controls are terrible. I was so frustrated I pulled up a bunch of reviews and the majority of them echoed my later conclusion – the game is great but the tablet controls are unsatisfactory and it’s worth playing the game in a different form. So next I bought the game for my OUYA and loved it. The game is funny and sarcastic. In the game you choose three characters (out of an available seven) to go in and explore the cave, or rather, The Cave. 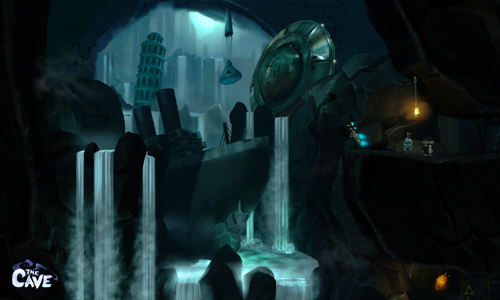 Each character has a different set of abilities and can reach different parts of the cave. As you progress you learn the stories of each character, and they aren’t always what they seem. The playthrough isn’t terribly long and you can replay choosing different characters to reach different parts of the cave, though there are a few areas you will play through during each pass, which can be a little repetitive the third time you play (if you want to play all the characters). My favorites were the Twins, the Scientist and the Explorer. Bonus points to the developer for making half the playable characters female. Game includes plot driven exploration, puzzle solving and humor. Available on Steam and OUYA. Double Fine has been up to some interesting stuff lately, I cannot wait for the second half of Broken Age and their older games are well worth playing, there is a special spot in my heart for Psychonauts which I didn’t play until a few years ago. Let’s talk games. I have a PS3, a PC, an OUYA and an iPad. In wintertime I want games to play in my living room so the PS3 and the OUYA are my focus, otherwise I am often looking for something to pass the time on a flight so I look for games for my iPad. My PC gaming has fallen away with the exception of a few extended story lines or games bought through Steam or Kickstarter (Dreamfall Chapters and Broken Age part 2 are what I’m currently anticipating). With all these platforms I’m only slightly aware of all the games out there that I know I’d like. (Even doing some link gathering for this post has led me to some gems that have been around for a while but are new to me.) Lately I’ve been depending on the podcast The Indoor Kids for game recommendations, and they do an amazing job but their focus as been on Xbox lately. I’m looking for a website or news source that is curated enough to not be overwhelming, my usual sources – Jay Is Games, Ars Technica, Touch Arcade – are often more information than I can parse. So, I’m curious! Where do you find yourself looking for new games? What platform do you prefer? What news source do you trust? Have you seen the new game Transistor on steam? (Same people who made Bastion). Its SO GOOD. Also, there is a new one coming out called Child of Light that also looks nice. I haven’t heard of Transistor but I’m already excited about it. I did hear about Child of Light but I need to look up more about it. Thanks! please oh please recommend more games! especially ones that play well with iOS. I’ve finished all your other recommendations and I’m game hungry. shawn – I have a few to share and I’ll do it soon, thanks for the prompting!